Ethics – We will be well-informed in the regulations, rules, and compliance issues that apply to our profession. We will apply this knowledge to our conduct as responsible surveyors, and will adhere to the highest standards of ethical conduct. “I recently hired Geometrix for a lot split. My attorney initially had recommended another survey company, but fortunately I called Geometrix just as a price check against the 'recommended' survey company. When the quote come back that was very competitive, I decided to go with Geometrix. “I would certainly recommend Lou/Geometrix. He completed a survey of a small lot of land I own in Glen Park, on which I plan to build a single family home. I was up against a tight deadline to get the drawings into the city, but he was able to deliver exactly as he promised. The survey included contours, spot heights of adjacent buildings, existing structures and city monuments etc. Lou will also be assisting my contractor in marking the plot boundaries at the beginning of construction. 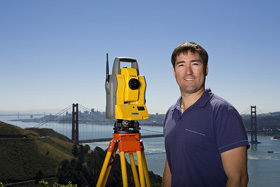 “…I really appreciate everything you did from answering emails promptly to in my opinion being one of the top if not the best surveyor in San Francisco. Your surveys from preliminary through to the final version were always accurate, detailed and meet the standard of care required by both the city and the state. I consider myself very lucky to have had you working for me. Copyright 2012 www.geometrixsurvey.com, All Rights Reserved.